Big ship. Big base. Yeah, it looks like Halo 5. 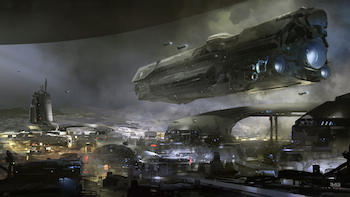 Halo series developer 343 Industries knows you're desperate to get more information about the game that may or may not be called Halo 5, so the least they could do - almost - is release a single piece of concept art to showing a place from Master Chief's new adventure. Ok. It's not a lot, but I'll give it to them: That's a pretty cool ship. The image wasn't merely an attempt to feed their fans' fervor: Yesterday's post on 343's blog announced that art director Kenneth Scott will stepping down for personal reasons. Though Scott will no longer play a leadership role in the game's design, he will continue to work with the team as a consultant. Scott will be replaced by 343 lead concept artist Nicolas Bouvier. Scott's departure is the latest in a series of high-level personnel shifts at 343 in recent months. The studio brought on Tomb Raider creative director Tim Longo last month, replacing Halo 4 creative director Josh Holmes, who will stay on as an executive producer at 343. Former executive producer Kiki Wolfkill will also remain at the studio, "developing exciting new stories, experiences and technologies that will transform the way that you experience Halo."